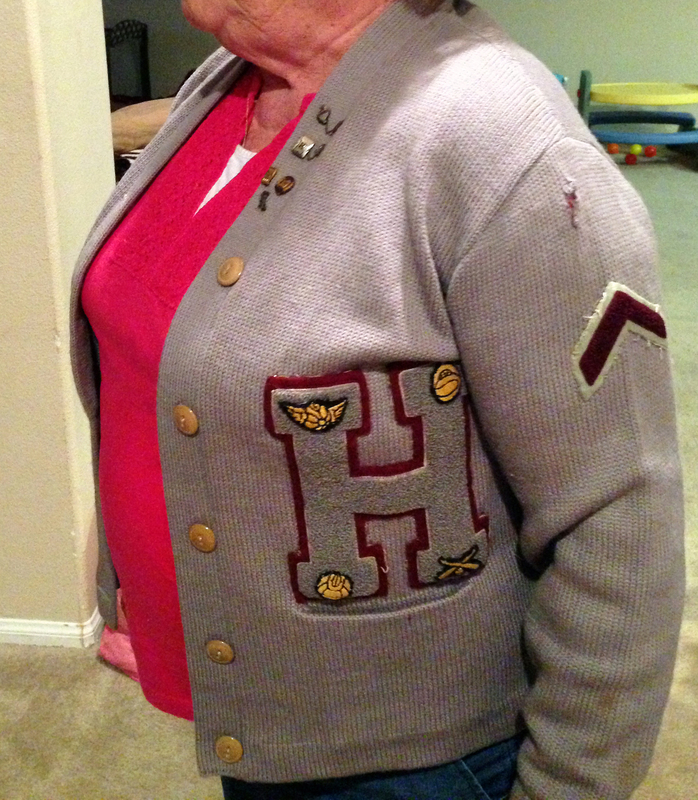 Hart High School | Newhall, Calif.
Noemi Lund (nee Noemi Duran, Class of 1951) models Hart High School's original colors: maroon and gray. Photo courtesy of Noemi's neice, Jennifer Jones, who also graduated from Hart. As of 2013, Noemi lives in Kalispell, Mont. Noemi is sister to Esther Duran, Sam Duran and Alice Duran. Esther, the eldest, attended high school in the San Fernando Valley and married Hart grad James Dyer. Sam and Alice graduated from Hart. The Durans lived on the property that became the southeast corner of Valencia Boulevard and Magic Mountain Parkway — across Valencia Boulevard from the Valencia Library and Sheriff's Station. According to Gwen Booth (Gallion) from the original graduating class of 1949, a committee of the student council selected the colors (maroon and gray) and the mascot (the Indian). She served on both the selection committee and the council. "I was one of the ones who voted to change the colors. It was very painful to break tradition, and the color change didn't come without a lot of thought and soul searching. The idea came from the ASB, not any of the coaches. We could no longer find decorations that were in the colors of maroon or grey. Nothing was available, so our school colors were already compromised at dances and (in) paper products for other uses. The gym and athletic uniforms in those colors would fade after several washings to various shades of brick-red and grape, and the grey to dishwater off-white. Our teams didn't make a pretty picture on the fields by the end of the seasons. Clothing in those colors didn't exist anymore, so we couldn't wear school colors to show our school pride. "When it became evident that the change had to be made — first to red, white and black and later to red and black with white — it came with a full vote of the student body of the classes of '67 and '68. (True,) Mr. Cecil Sims' penned Fight Song didn't rhyme quite as well for a few lines like it used to, but we managed and made it work and it never changed the spirit of the school or the pride in our high school. The sports teams looked sharper, and so did the dances. "We Indians still know the traditional school colors were maroon and grey, and that remains part of Hart High's history, but we were, and are, just as proud of the sharp colors of red, black and white that we had to adopt. That was a change that became absolutely necessary."